With schools back in session and the holidays approaching, many of us start to think more about the security of our communities. While crime is down, budget cuts in police departments across the country add to local concerns, and people in your community may be seeking new, cost-effective ways to make your neighborhoods safer. Efforts like NCPC’s Celebrate Safe Communities (CSC) initiative, which is supported by the U.S. Department of Justice’s Bureau of Justice Assistance, are becoming more important in helping people across the country minimize the negative impact of law enforcement budget cuts and create safer communities. The CSC initiative spotlights a community’s crime prevention efforts, raises public awareness of crime prevention and safety, and helps keep neighborhoods safe through ongoing prevention and awareness activities. * Ask town leaders to organize a Crime Prevention Through Environmental Design task force to create laws that can help address crime through environmental design. These laws should address lighting, security hardware, street and building access control, visibility and landscaping – all with an eye toward reducing opportunities for crime to occur in the community. * Work with your neighbors to establish a community watch group. Your local police department can help. Watch for suspicious or unusual behavior in your neighborhood. Get to know your neighbors and their families so you can look out for each other. * Parents should know where their children are. Have kids ask for permission before leaving the house and give you a firm time when they will check in or be home. Set limits on where kids can go in the neighborhood, and designate a safe house – a neighbor’s home where your children can go if they need help and you’re not available. * Become involved in NCPC’s Celebrate Safe Communities initiative. CSC volunteers work with local law enforcement to address local issues. Across the country, hundreds of local CSC groups plan and host events that range from block parties and community safety fairs, to anti-drug marches and neighborhood cleanups. NCPC provides event organizers with free downloadable crime prevention resources, training programs, Neighborhood Watch manuals, safety-themed comic books and an array of other valuable materials to help support their efforts. A single CSC event can reach up to 1,200 residents and often serves multiple neighborhoods, according to an NCPC survey. 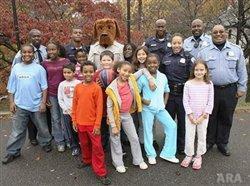 Organizers say the support materials – many featuring NCPC’s popular character, McGruff the Crime Dog – are instrumental in making their events successful.